PChop onion finely on a chopping board. Put chopped onion into a saucepan. Add tomatoes, tomato puree, salt and pepper and stir the mixture together. Cook on a low heat for 15 minutes, stirring from time to time. Slice the barmcakes into halves. Spoon the tomato sauce onto the barmcake, evenly to the edges. 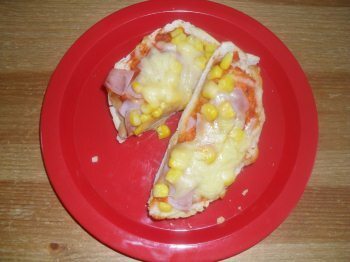 Once you have made the basic pizza you can create a pizza of your choice with the topping ingredients. Once you have decorated your pizza, put them into the oven at 220 Degrees Celsius Gas No.7 for for 15 Minutes.